A side dish, a sauce, and a meal all in one! A roulade is piece of poultry, meat, or fish wrapped around a stuffing. Pounding the chicken thinly enables you to add in other ingredients, wrap it up and cook it as one item, rather than two or three. Another bonus is that the stuffing in this roulade takes the place of a sauce. Each bite of chicken includes the sweetness of the sun-dried tomato, the wilted spinach, and creamy melted goat cheese. My boys often have an aversion to anything green on their plate. However, if your kids are more adventurous than mine, you can dramatically change the flavor of your roulades by using basil pesto and experimenting with some of your favorite cheeses. Heat the oven to 375 degrees and line a baking sheet with parchment paper or foil, and set aside. Two at a time, place the chicken breasts, smooth side up, between two sheets of plastic wrap. Using a meat mallet, gently and evenly, pound the chicken to about 1/4" thick. Set aside in the refrigerator until ready to use. Place each pounded chicken breast lengthwise on the covered baking sheet, smooth side down. Season with salt and pepper. 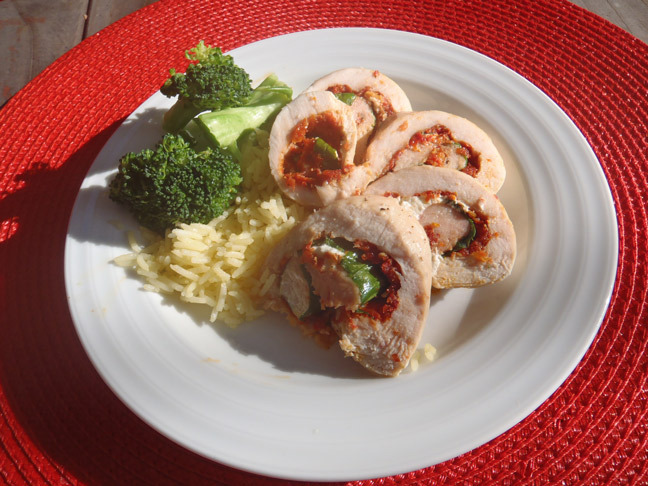 Evenly divide the sun-dried tomato pesto and spread it over the surface of each piece of chicken. Press 3 spinach leaves on top, and add 2 teaspoons of goat cheese to the center of each. Very gently and tightly, roll the chicken away from you. Rub top of each roulade with olive oil and season with salt and pepper. Roast the roulades until the internal temperature reaches 165 degrees, about 15 minutes. Slice in half on a bias, or in a few rounds. *Sun-dried tomato pesto is usually available at Trader Joes, and Gelson's, however if it's not available, simply finely chop sun-dried tomatoes marinated in oil — or see my recipe for Sun-Dried Tomato Pesto!